Pods Ireland was founded by David Griffin in June 2011 and started operating from his home at Glenwood Studio, Littor Strand, Asdee, County Kerry. 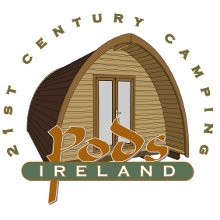 Pods Ireland is the only licensed distributor of the Pod™ range in Ireland and is focused on developing new Pod sites throughout the island of Ireland. The Pods are manufactured by the Kerry based company Cisco Woodframe Homes. Following redundancy in 2010, David began looking for new opportunities to allow him develop a more sustainable livelihood for his family. Ideally, he wanted to be able to work from home, after years of long daily commuting to Limerick from his North Kerry base. It was the location of his home that inspired the first ideas of Pods Ireland. With his garden backing directly onto Littor Strand, the obvious idea of a ‘Beach Camp’ came to mind, however, given the vagaries of Irish weather, this was not deemed a likely runner. In his search for ideas, David came across the UK Company building and marketing an insulated, heated and durable Pod, that was achieving great acclaim in UK camping circles. Once he had seen these structures in situ, David immediately recognised their potential for Ireland, and set about investigating and researching how best to bring the PODs to Ireland. Having entered negotiations to secure a distribution agreement for the island of Ireland, David began his research. The cost of transporting the Pods to Ireland was prohibitive, so he set about looking for local solutions. He sourced a manufacturing company, CISCO Wood Frame Homes in Co. Kerry, to build Pods according to the exacting standards of Pods UK, who place great emphasis on sustainability and materials used. All wood used is in compliance with the Forest Stewardship Council guidelines, and the Pods are insulated with Earth wool. The UK Company, Newfoundland Leisure Lodges, are fully supportive of this arrangement and have supplied the construction templates to Cisco Wood Frame Homes. If you want to know more about me, please feel free to get in touch through this site or through my social media! The POD - What is it?Read on to learn more about the Pod. On the bottom line it's a wooden hut, unique and stylish, it is like no other. It is camping for the 21st Century. The POD is designed to be comfortable - The special Decra roof tiles, backed by a 40 year product warranty, cut down the noise of heavy rain and the window and lockable French doors are double glazed to reduce condensation and provide sound insulation. The wood used in the construction is a naturally 'warm' material but to provide extra winter warmth we have installed Earth wool insulation inside the walls while a special foil layer under the roof helps keep summer temperatures in check. (Optional under floor insulation also available). There is a small, high level window in the back wall, this not only provides light but will help keep the living space ventilated and aid 'through draft' on hot summer days. The Pod is wonderfully enigmatic - it is many things to many people. It has real presence...but does not impose. It is a complex shape.... but is beautiful in its simplicity. It is a ‘blank canvas’ which can be a basic shelter or dressed to be as sumptuous and elegant as you choose. It occupies a curious niche in our psyche that takes us back to the very roots of civilization on Earth - a shelter that our instincts tell us is the comfort zone that our ancestors knew well! Time in a Pod is restful and positively energising……a place to get closer to yourself and your friends……enjoy. We installed four pods on our site in August 2012 and they immediately became part of the landscape among natural bogland overlooking the magnificent River Shannon. The pods are very pleasing to the eye drawn to natural beauty and with the swift and uncomplicated installation process, they immediately appeared as if they had belonged to our landscape forever. They have wintered well and were very cosy for all of our brave winter glampers! Having overnighted in one ourselves, we understand why our guests hate to leave them and we are looking forward to ongoing demand for a taste of tranquility at the water's edge in 2013. Best Regards, Eilish Beirne, Battlebridge Caravan & Camping. Stayed in Battlebridge last weekend for a hen do. I was the organiser of the party and we wanted something fun, classy and different. Battlebridge was definitely a good choice. The eco-pods were comfortable, warm, and really cute. ...It was great to have a little space and umbrella outside the eco-pod. Our party loved them - loved having our own space and privacy as well. Battlebridge Caravan & Camping Park - Reviewed August 27th 2012. 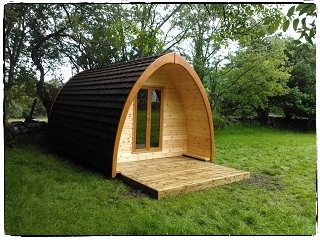 Elaine (Cork) Glenwood Studio - Camping Pod - Reviewed August 2011. "We stumbled upon the "Pod" on the quest for an alternative camping experience - and we were not disappointed! A stone's throw from Littor Strand, our stay in the Pod was one of the most memorable weekends I've had. David & Rebecca could not do enough to make our stay enjoyable. I'll definitely be back!" Denise (Cork) Glenwood Studio - Camping Pod. The POD - Where did it come from? The story goes like this - Ian Bone a civil engineer from Cumbria in the UK was on a holiday in Ireland some 20 years ago which took in the Dingle peninsula. Ian held a deep interest in the archaeological legacy of the early settlers of these Islands from the late Stone Age through to early Christian structures. As he travelled back from Ballyferriter to Dingle town on that holiday, he once again needed to pitch his wet tent for another damp and sleepless night. There must be a better way to do this, he thought! - Something dry and warm! - Something that blends into the natural landscape! - Something that makes camping fun again! Some years later when the Pod was created, Ian was reminded of the beautiful shape of the Gallareus Oratory on the Dingle peninsula and the uncanny resemblance that had mysteriously transcended through time! Wild Atlantic WayWatch the video to learn more about the Wild Atlantic Way!